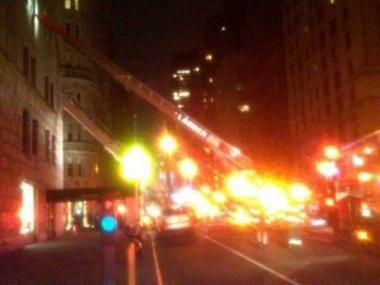 MANHATTAN — One person was injured in a fire at the famed New York Athletic Club in Midtown Saturday night, officials said. The fire erupted on the fourth floor of the club's 180 Central Park South building at 5:45 p.m., according to the FDNY. The blaze, which started in the wall, was brought under control about 45 minutes later, fire officials said. One person was taken to Roosevelt Hospital with minor injuries. The club, which dates to 1868, claims nearly 120 Olympic gold medals.